Xobni recently released its new ‘ Xobni Extensions’ feature, providing users with the option to conveniently view live details about their contacts fed from sites such as Facebook and Linked-In. These extensions have been the subject of a great response from upgraded Xobni users. We will be upgrading more Xobni users over the next several weeks. We understand that sometimes users prefer to use more screen space for Xobni’s other helpful panels. To collapse the ‘Xobni Extensions’ panel simply click the double arrows directly to the right of the extension icons. Click again to display the ‘Xobni Extensions’ again. The entire Xobni sidebar can be collapsed by clicking the double arrows found at the bottom of the Xobni sidebar. The entire Xobni panel can be dragged left or right to fit the exact width the user desires. Simply hover over the black dividing bar on the left side of the Xobni panel for the re-size icon to appear. Each panel (Network, Conversations, Files Exchanged) can be dragged vertically to display as much information as desired. 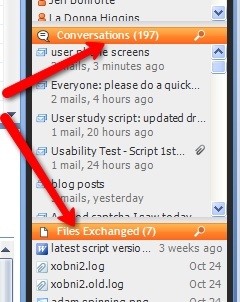 Any ‘pop-up’ panels, such as the ‘Send Xobni Invites’ panel, can be closed at any time by clicking the ‘x’ icon. Xobni will continue to develop ways to make your user experience as enjoyable as possible. Thanks for being part of the Xobni experience! A great addition to this list would be the ability to reorder the panels vertically.